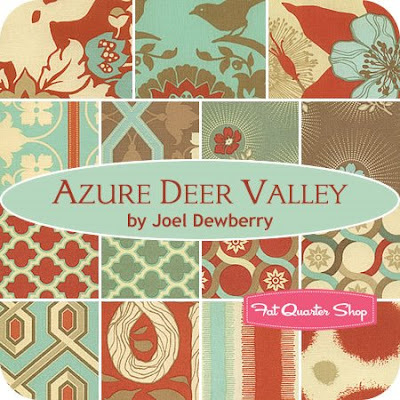 Sign-ups for Doll Quilt Swap 6 are now open! I've always considered this swap to be the "gold standard" of all of the mini quilt swaps, so if you're even remotely interested, check out the pool and the discussions over in the Flickr group. Spots are limited, and going quickly. 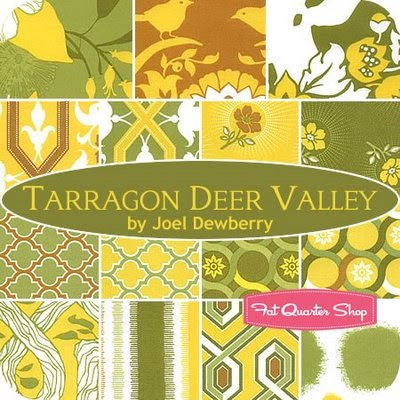 I just stumbled across these in the Coming Soon section of the Fat Quarter Shop's site. I hadn't seen anything about this line yet. That azure line has my name written all over it. The tarragon's pretty awesome, too. I finished up my Bushfire Quilt stars last night, and I am happy to report that I was able to make 7 to send off to Tia. It was my first time making wonky stars and I relied heavily on the Silly BooDilly's great tutorial. 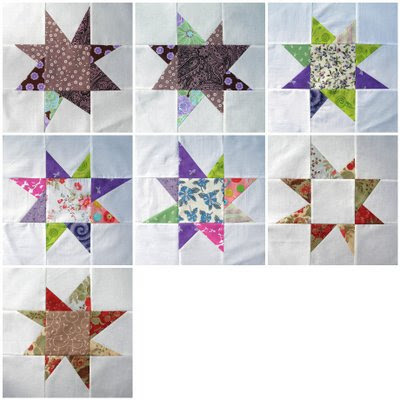 For all of the blocks containing the stars' points, I used 5" squares and then trimmed them down to 4.5" before assembling. The best part? I used 100% scraps and some squares that I had received from the Spare Change swap. They were fun to make, and I am SURE that I'll be making more of these! I'm so happy to be able to support this wonderful effort. Thanks again to Tia for taking this on ... I am sure this project has grown far beyond her wildest expectations, but she's handling it like a champ. And it will yield such beautiful quilts for so many people who are suffering right now. I can't wait to see the finished products! Speaking of virtual quilting bees, I was invited by the "Queen Bee" quiltinkimmie to join her newest venture, Buzz Cuts. Buzz Cuts has 16 members and February was the first month of the swap. First up was themad1s, who was eager to have something made from her recently acquired stash of Heather Bailey fabrics. I was very excited to work with my selection from the Pop Garden & Bijoux lines, as I've admired these fabrics since they were released but haven't had the opportunity to make anything from them yet. I decided first on a string block, a design that I recently tried for the first time on a Crafster block and was thrilled with the results. I think the design works equally as well with these colors & patterns. I had enough leftover material to make a bonus block, and thought through several different designs in my head before deciding on a simple block of framed wonky strips. The more blocks I make, the more I really enjoy making up my own block patterns rather than following more traditional ones ... although it all really depends on the fabrics. Actually, what I think I enjoy the most is really observing the fabrics that I'm working with and matching it with the appropriate design. I'm pretty happy with how they both turned out. It's going to be a very, very cool quilt. Belonging to a couple of different groups has been a lot of fun, especially as the personalities of the groups begin to emerge. Buzz Cuts is full of very eager, enthusiastic quilters. As soon as the fabric starting hitting members' mailboxes, the blocks were being posted at a fast & furious rate ... and most people made 2 or more blocks. In fact, I finished mine last week and I think I'm one of the last ones -- and the month's not even half over yet! I think all of the members are hungry for more ... I can just tell that people are already itching to receive March's fabrics. 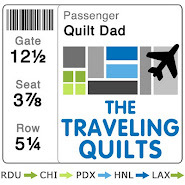 It's official: the virtual quilting bee bug has bitten, and it's running rampant like a virus throughout blogland. Personally, I think it's great to see so many people who are interested in connecting with new quilters around the world and truly collaborating on something that can be treasured for years to come. Rachel over at P.S. I Quilt has opened up her new bee, called bee inspired. Cute name, huh? And get this: just for letting her pick my brain about running a virtual quilting bee, Rachel surprised me with a new (and much needed) blog header. Isn't it great?? If you're reading this on Google Reader or Bloglines or something, click over and take a look. Thanks so much, Rachel! (Rachel was also thrilled to hear that my wife has been bugging me to read the Twilight series, and I finally caved. I'm about done with book 2 already). This one looks like it's filling up fast (if it hasn't already). Sarah from Sarah's Corner is also looking for a few good quilters to round out her new group. Head on over and say "hi" to Sarah for me. If you're at all interested in joining one of these groups, check out Rachel & Sarah's pages for more info. Of course, I'd highly encourage joining up -- they're a great way to try new things, practice new skills, meet amazing and inspiring people and, oh yeah, they're a ton of fun, too! Blocks, blocks and more blocks ... that's what I've been up to lately! Driving the flurry of block-making has been the fast-approaching deadline for the Craftster Lap Quilt Swap. I had 22 blocks to make for this swap and, with the Christmas holidays falling right in the middle of the swap, I was starting to feel the pressure in the past few weeks. First, a block for Ashley. She sent an inspired (and inspiring!) selection of browns, whites, and teal greens with lime accents. I decided to go kinda improv on this one, with intentionally wonky horizontal stripes. I had a lot of fun selecting some coordinating prints (mostly from the "Nest" line) from my stash. It's one of my favorites!! Next up, two blocks for whoopdedoo_5. I've been wanting to try making some string blocks, and I felt that this selection of Surf & Sand fabrics was the perfect place to start. I loved making this block and I love the end result even more. I'll be making more blocks like this, so don't be surprised when you see them! Here's a block for thatbluesea. I wanted to keep it simple and let the teal and red combo speak for itself. I love the look but, unfortunately, it's not quite finishing out at a nice, clean 12.5". I think I'll be making a second (replacement) block before sending this back, just in case. Next, a block for swap hostess (and SewConnected regular!) Audrey. I felt like the fun, vintage-y fabrics called for a more traditional block. The colors look so great together, don't they?! I tried to make Audrey a bonus block (below), but ran out of enough long strips of fabric to put a top and bottom border on it. I sent it anyway ... I thought Audrey could finish it up if she likes it, or use it for another purpose. The block below was made for libbyk. Her fabrics selection included a bunch of black and white prints (very much outside my usual comfort zone) and a splash of color. I hope she likes it! Tina of the Little Blue Cottage put out a call for people interested in participating in another virtual quilting bee a few weeks back. I've long been a fan of Tina's blog and couldn't resist, so I signed up for her new group aptly titled the Cottage Quilting Bee. I was very excited to see the group fill out with some familiar faces, some newer swap buddies, some bloggers whose work I've long admired, and some brand new-to-me quilters. It looks like it will be another great group and, judging from what's been posted so far, will produce some top-notch work. First up for the month of February was Darci of Stitches & Scissors. She sent along a selection of scrappy pinks and greens and requested log cabin blocks. The best part? Darci was cool with us adding in additional fabrics as long as they coordinated with her theme and vision for the final quilt. I started pulling fabrics and, before long, had way too many for a single block. So, because self-editing and refinement are not my strong suits, I just decided to make two blocks rather than try to get it down to one. For the first, a more traditional log cabin block with one of my favorite Tula Pink rabbits in the center. Darci sent the wonderful mushroom fabric (Alexander Henry, maybe? ), the pink plaid, the white with pink and green circles, and the green with the mini white dots. Besides the bunny, I added the pink and green paisley, the raindrops across the top, some of my favorite Amy Butler dots, the green woodgrain, some strips, green florals and plaid, and some more Tula (dragonflies) across the bottom. SO cool! For the second block, I decided again to frame a critter in the center ... this time, a green dragonfly from Tula's Flutterby line. I gave this one more of a pattern, using the same fabric on the right and left, followed by another on top and bottom, and kept going with it. I especially love the bits of pink Ginger Blossom across the top and bottom (second row), and wish I had more room to leave more of the Heather Bailey jellybeans on the left and right. It's a thin strip and I'm afraid they're going to get lost when the block is connected to the others. Looking forward to March already!! 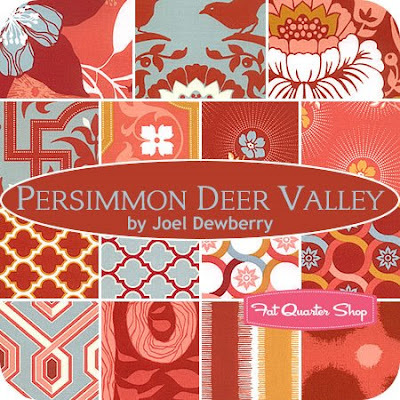 Speaking of virtual quilting bees, I continue to get a lot of interest in the SewConnected groups, and especially in SewConnected 4 when it gets off of the ground. I'd love to have a fourth group sometime in the future; unfortunately, I don't think I'll be able to start it anytime soon. 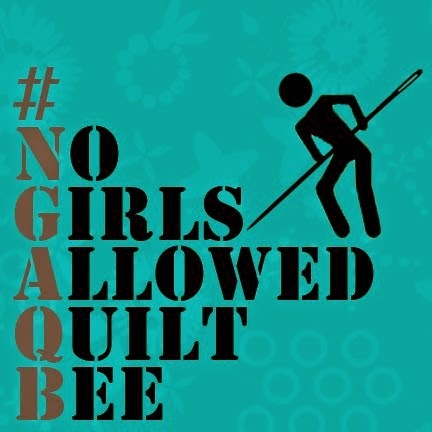 That being said, if anyone is really itching to participate in a virtual quilting bee and might actually be interested in organizing one herself, I can personally deliver to you a list of names and email addresses of people who would want to play along. I'd love to see everyone who wants to be able to participate in one of these great groups ... so just let me know! January was a good, good month for mini quilt swapping! In the 6-12" Mini Quilt Swap group over on Flickr, the challenge for the month was to design a quilt inspired by the Quilts of Gee's Bend. I was so excited to hear that this was the theme, since I've been itching to push myself more in that direction ... and, despite my New Year's resolution to try to curb my growing swap addiction (at least a little bit), I just HAD to sign up for this one. I knew from the start that I wanted to work with solids and, after browsing through the inspiration quilts, I quickly decided to make something in the spirit of this, this, and this. I decided on a main color pallette of khaki, mustard, deep chocolate brown, army fatigue green and unbleached muslin, with some red accents. Then I decided to make one block completely different (blues and pinks), to give the feeling that maybe it was leftover from another quilt and used here to patch a hole. Overall, I was thrilled with how it came out. This was definitely one of the hardest things I've made to part with, but I have enough strips of fabric already cut out to recreate it for myself. One of these days ... ! The best consolation is knowing that it will have a happy home in Oregon with Jessica (jmbmommy). Isn't it the coolest?? I just love how we both started with the same theme, but the two quilts went in different directions ... both in terms of color and style. The colors Jessica chose are AMAZING ... so much brighter and vibrant than my pictures show. And because quilters really are the most generous people on earth, Jessica sent a bunch of loot along with the quilt. Yes, that is a little quilted zipper bag there on the left. So cool! And I absolutely love, love, love the fat quarter of circus-themed fabric that was included. I can't wait to make something with it! Thanks a ton, Jessica. And if you're not signed up for the 6-12" Mini Quilt Swap group yet, what are you waiting for?? Tia (aka CampFollowerBagLady) set up a new group on Flickr today called the Bushfire Quilt Project. The idea is to do our little part to help the people that are suffering from the devastation caused by bushfires in Victoria, Australia. Tia's request is simple: donated quilt blocks (stars are preferred) that she will, in turn, make into quilts for those suffering "so they can wrap themselves in our love and prayers as they return to rebuild." Sounds easy enough to me. If you'd like to help out, please visit the Flickr group to learn more. 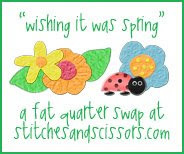 New blogger friend Darci is hosting a fat quarter swap over on her blog. If you're on a fabric diet like I am (and I know many of you are), this is a great way to get some new fabrics to work with. Head on over there, say "hello", and sign up to get some great new FQ's. Tell her Quilt Dad sent'cha.